Most communication in a health service happens when the worker and client come together and talk. Health professionals and organisations can experience challenges in achieving effective verbal communication with clients from a culturally and linguistically diverse background. There is often a gap between what health professionals intend to convey and what the client understands. Building interpersonal and cross-cultural communication capabilities amongst health professionals is essential in facilitating health literacy(1). 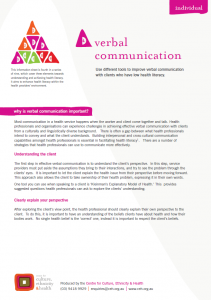 There are a number of strategies that health professionals can use to communicate more effectively. The first step in effective verbal communication is to understand the client’s perspective. In this step, service providers must put aside the assumptions they bring to their interactions, and try to see the problem through the clients’ eyes. It is important to let the client explain the health issue from their perspective before moving forward. This approach also allows the client to take ownership of their health problem, expressing it in their own words. One tool you can use when speaking to a client is ‘Kleinman’s Explanatory Model of Health.’ This provides suggested questions health professionals can ask to explore the clients’ understanding. After exploring the client’s view point, the health professional should clearly explain their own perspective to the client. To do this, it is important to have an understanding of the beliefs clients have about health and how their bodies work. No single health belief is the ‘correct’ one, instead it is important to respect the client’s beliefs. The teach-back technique is an effective method for ensuring that clients understand what you have told them. See the Using the teach-back technique information sheet. Motivational Interviewing – this encourages the service provider to express empathy and support the client’s self-efficacy by avoiding argumentation and respecting their beliefs.